A few weeks ago I invited my parents over for dinner on a weeknight, but I needed something that I could fix ahead of time and then let it cook in the oven - lasagna is perfect for that. I had a package of sausage I wanted to use in the lasagna - both sweet and hot Italian sausage. How cool that they packaged them like that? It was 2 links of hot and 4 links of sweet. Using sausage as my inspiration, I went in search of a new recipe. 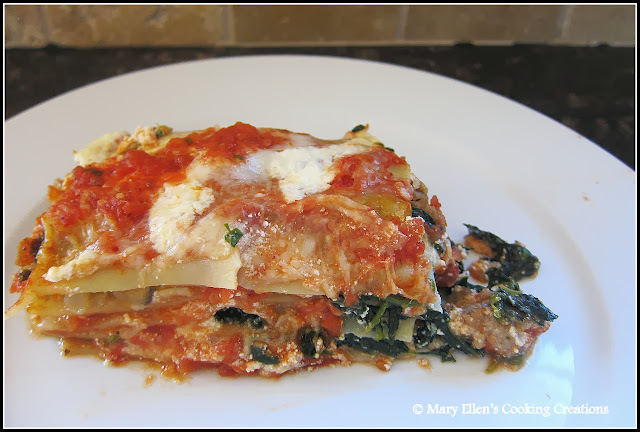 I found a recipe for Sausage, Spinach, and Mushroom Lasagna on the Eating Well web site. After reading through the ingredients and directions, I couldn't wait to make and eat it. 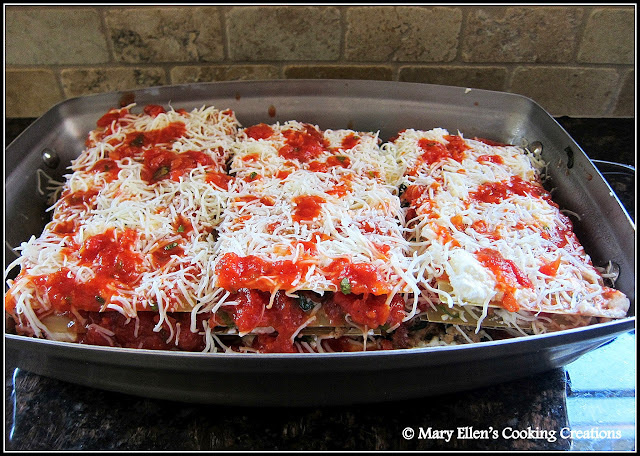 This lasagna seemed like the perfect compromise when one person wants a meat lasagna and someone else wants a veggie lasagna, and it really was the best of both worlds. When I was cooking the sausage, mushrooms, and spinach I started to taste it. I liked it so much that I could see this part of the recipe being a meal on its own, maybe served over polenta. I made a few small changes to the recipe. It called for whole wheat lasagna noodles, but instead I used the no bake lasagna noodles - I just like how easy they are. I added onions and garlic, used spicy and sweet sausage instead of only spicy, and also added a few layers. Crumble the sausage into the pan and cook until browned, about 6 minutes. Add mushrooms and water; cook, stirring occasionally until the water has evaporated and the mushrooms are tender, 8 to 10 minutes. 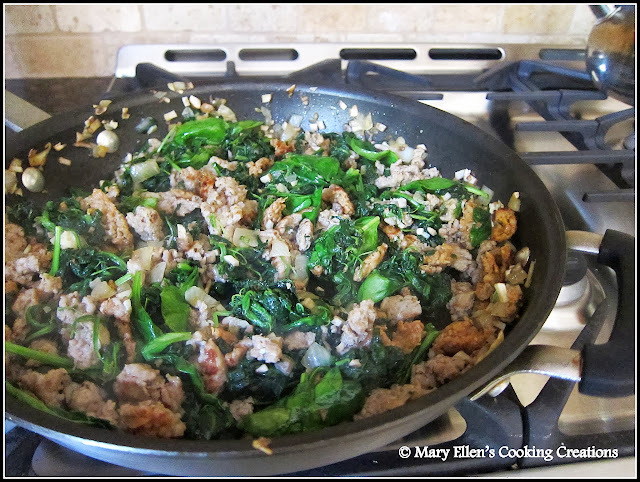 Stir the spinach into the pan; remove from the heat. To assemble lasagna: Spread a thin layer of the tomatoes into the baking dish. Place three noodles in the dish - they shouldn't be touching each other, leave just a bit of room between them as they expand when cooking. Top with ricotta and lightly spread. Top with some of the sausage mixture followed by some tomatoes and mozzarella. Start again with noodles, ricotta, sausage, tomatoes, mozzarella. End with your 5th layer of noodles, some tomatoes, and mozzarella. Cover with foil and bake until bubbling and heated through, about 1 hour 10 minutes. Let rest for 10 minutes before slicing. This is the best lasagna. I've made it for friends and they are always impressed. I'm making this again today - can't wait! I usually add an egg to the ricotta mixture, and I always end up having another 1-2 cans of sauce (crushed san marzanos) set aside as a topping for leftovers. LOVE the no boil noodles! So easy!